Power supplies for supplying KNX devices with bus voltage. Output with integrated choke to supply KNX bus lines. Output DC 30 V to supply additional devices. Rated current can be flexibly split up amongst outputs. Suitable for operation in systems with emergency power supply. Isolated signal contact for operating message and diagnostic message. Two KNX power supplies of the same type can be connected in parallel. Installation on DIN top-hat rail. VDE approval in accordance with EN 60669-1, EN 60669-2-1. 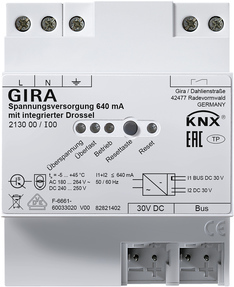 KNX connection and junction terminal included in the scope of supply.